MIAMI Anxious to avoid an Orange Bowl shocker, the Florida State Seminoles kept getting tricked. 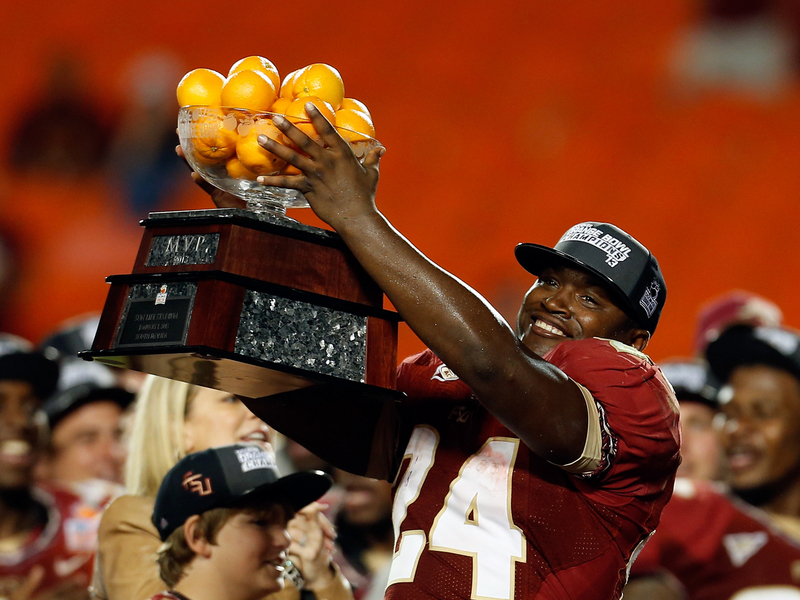 "I'm glad I'm a Nole, and I'm glad the seniors went out with a bang," Pryor said. "I always wanted to be MVP of a bowl, and I told myself that every time I get the ball, to try to make a big play." After the game, the Seminoles wore T-shirts that read, "Florida Statement." "It's not the national championship, but right below," defensive end Bjoern Werner said. "Not a lot of teams can say that." "We knew that they were going to play us tough," Florida State coach Jimbo Fisher said. "But our kids, it's another step in which we handled the big platform, and I'm very proud of them." "We just kept playing," he said. "Now we're going to enjoy ourselves." "Definitely the best defense we played all year," Lynch said. "They were always in the right spot at the right time, it seemed like. They were hungry out there." "It probably wasn't the smartest thing to force the ball there," Lynch said. "I'm upset," Carey said. "Florida State is a well-oiled machine. They beat us, no doubt. That doesn't change the fact I don't like to lose." "You've got to play to win," Carey said of the trick plays. "We saw some things. We knew we had it. Gosh darn, our kids executed it." "We wanted to leave a legacy and change the culture in what we do here," said Manuel, who became only the second quarterback to go 4-0 in bowl games, joining West Virginia's Pat White. "You're reaping the benefits right now."